I think every group of kids had their 'secret' party spots for drinking beer. We had various ponds, pastures and 'the oil wells,' a site outside town where an oil pump and tank sat just of a little traveled back road where we'd park, listen to music and hang out. This strip was meant to kick off a fairly lengthy story about Wendell, Luthor, Alex and Harper attending a high school kegger. It ended up being the last strip I made for this series. 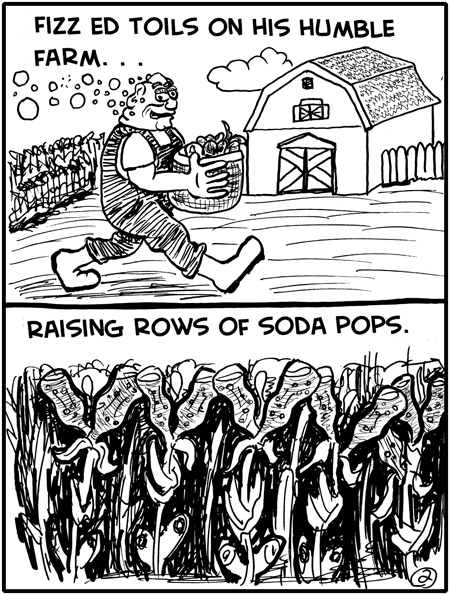 It had become increasingly evident through the production of these 16 strips that my process was too slow, and I needed to rethink my work flow. I had also been doing Brain Teaser Comics on the side, and that was working a lot better than Blank Tape, so my focus shifted. 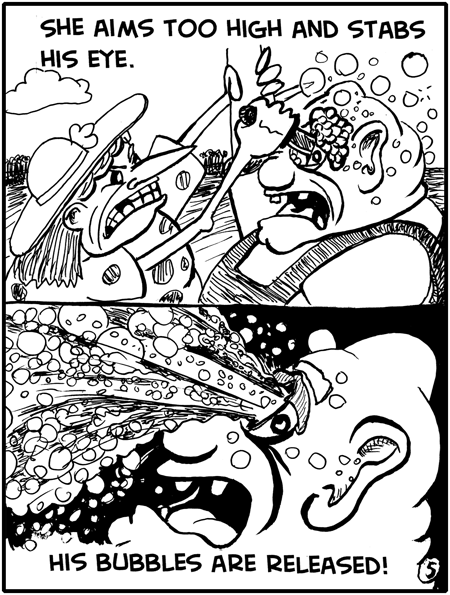 I decided to share these while Brain Teaser Comics is on hiatus due to a hard drive loss, and I found these finished strips on a backup disk. I hope you enjoyed them. Looking back on them, I learned a lot, and still like the characters and their designs. So much so, that when I was challenged to do a mini-comic back in October I came back to Wendell and Luthor as my characters. I think they have stories to tell, and I have at least one more mini-comic story starring those two idiots on the drawing board...literally. So, what of Blank Tape Comics? It is now my side project, and Brain Teaser my main focus. I will post miscellaneous strips, gags, mini-comics and other things here as they are completed, that don't fit the Brain Teaser mold. It will update when it updates and I have no plans for any regular release schedule. 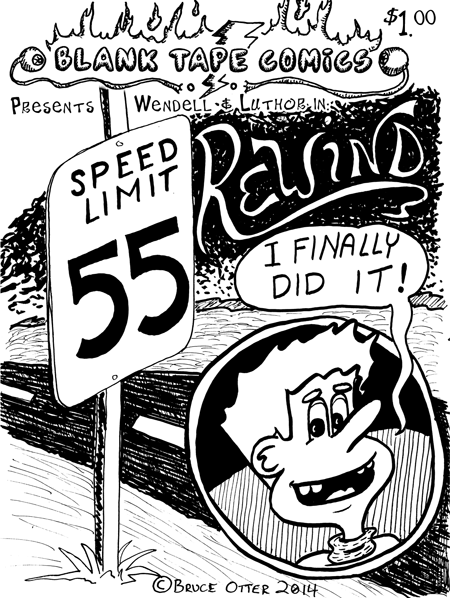 I hope you enjoyed the Wendell strips for what they were, a learning experience, an artist biting off more than he was ready to chew. Look for new comics at brainteasercomics.com in the New Year! Kids know how to waste the summer like nobody else. I had a job by the end of my sophomore year, but I still managed to waste countless hours at the Stop 'N Shop/CMart in my town. We didn't have many places to hang out. 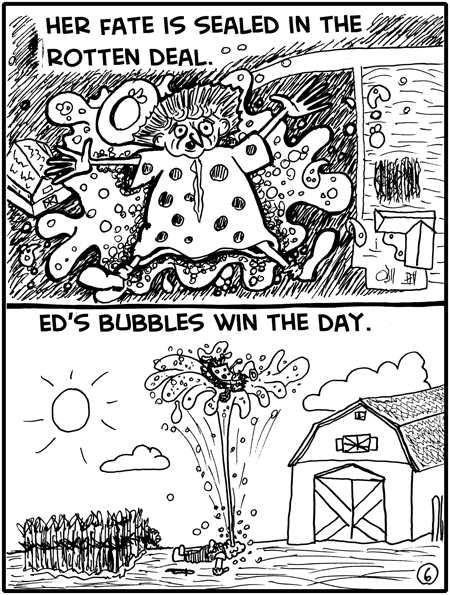 This strip was the start of a long story arc that gets a little more fleshed out in the next strip. Mrs. Winger, based on my Mom, is not much of a cook. I love you Mom, remember this is all in good fun! As teenagers we became torn between staying a kid and being grown up. Wendell succumbs to the desire to play. We also get our first introduction to Mrs. Winger, Wendell Winger's mom. Also a smoker. I was surrounded by them. 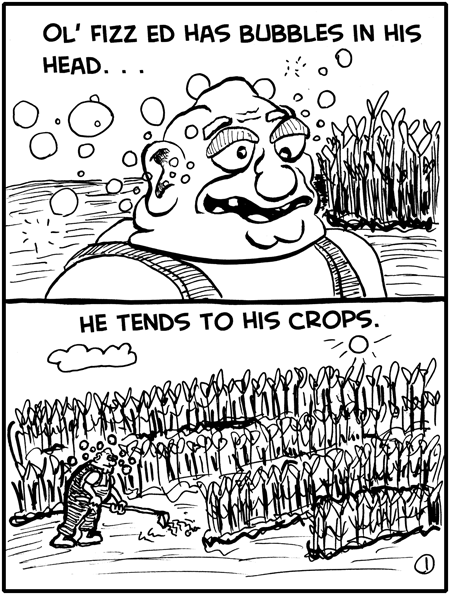 Probably my favorite strip I did for this project. No real punchline, just a moment that felt really real. One of those seemingly wasted Summer days that you really miss as you get older. I like the coloring on this one a lot. 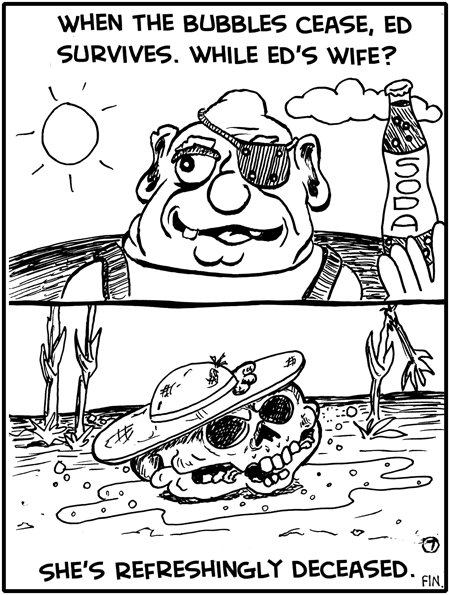 I realize that this was a strip steeped in nostalgia, filled with references to another time. Luthor is a composite of a few different friends, one of whom started smoking in 7th grade. I had a whole series of gags I'd planned around Luthor's smoking. Perhaps they'll find their way into a comic in the future. More AC/DC talk. Alex is a harsh force of honesty in the lives of loveable dopes Wendell and Luthor. These kinds of endless debates were a fun way to kill time in my misspent youth. Everybody had an opinion about what bands, albums, solos or whatever ruled, and which ones sucked. I still prefer Bon Scott era AC/DC to Brian Johnson. Both are great of course. We get introduced to Luthor's cousin, Alex in this strip. She's sort of a counter-point to their rocker ways, adding an alternative point of view. The conclusion of Wendell's 'Love is for Suckers' ordeal. Saxon was another band that meant quite a bit to me. 'Destiny' was actually the first album of theirs I ever bought, and I liked it a lot. Once I bought their back catalog I realized how much better and heavier their early work was. 'Destiny' suffered from a lot of the problems that Twisted Sister's 'Come Out and Play' and 'Suckers' suffered from, namely slicker production and tracks seemingly designed for radio and MTV play. Wendell's quixotic quest for a refund continues with an appearance by Dee Snider lounging in the pool! I really can't stress how much Twisted Sister meant to me as a band. 'Stay Hungry' is still one of my favorite albums of all time. I listened to 'Under the Blade' and 'You Can't Stop Rock 'N Roll' endlessly. 'Come Out and Play,' the followup to 'Stay Hungry' was a bit schizophrenic with some really great tracks, and some really terrible ones. All in all I still liked it though. When 'Love is for Suckers' came out, the disappointment was epic. It really did mark the end of the band. They were largely victims of their own success. A really good metal band who felt the pressure to release MTV friendly 'hits'. This strip introduces Harper, another pal of Wendell and Luthor. I never got a class ring, but lots of kids did. It seemed like the weirdest thing in the world to spend money on. I probably spent the money that would have gone into a class ring on AC/DC, Iron Maiden, Dead Milkmen and Weird Al records. 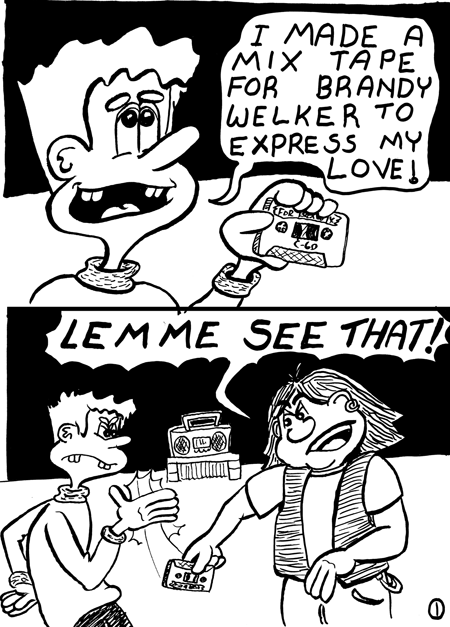 This strip features the return of the lovely Brandy Welker, object of Wendell's desire. She is key to Wendell's adventure in '55 Rewind'. For the continuity minded, this strip takes place prior to that story. I grew up in a town where wrestling was a big deal. My best friends' dad was our coach. I was terrible, and this strip is pretty accurate. In my entire high-school wrestling career I NEVER wrestled an entire 6 minute match. I pinned one guy even worse than me, and got pinned every other time I stepped on the mat. I quit mid season of my sophomore year. This is the first strip in the originally conceived 'Blank Tape Comics,' designed to be a 3 day a week gag strip with a loose ongoing continuity. HERE's the story of what went wrong. Set in the late 1980s it was the semi-autobiographical tale of Wendell, and his pals trying to figure it out in Reagan's America. Music was a big part of my life growing up, so each strip was titled after a song, and my original intent was to include a music video matching the strip title with each release. With that, meet Wendell in Walk This Way! 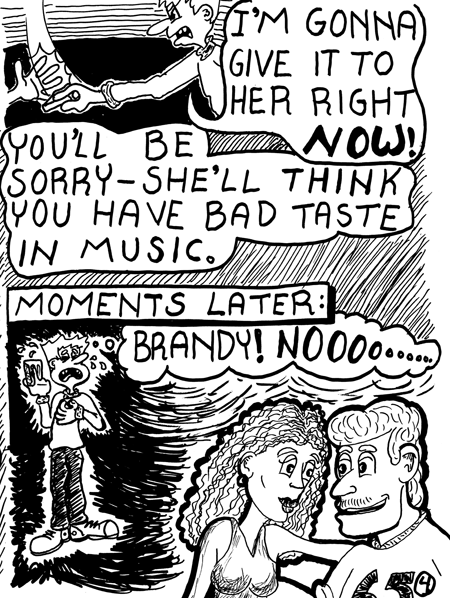 This version of Blank Tape Comics never really got off the ground, but I'm releasing the 16 completed strips on Monday, Tuesday and Wednesday over the next couple weeks for your enjoyment. Wendell, Luthor and Alex (You'll meet them!) will be back in mini-comics and other forms as their tales come to me. Over at Brain Teaser Comics, my other site, I have mentioned my Doomed original web comic that remains unreleased...until NOW! Discovering I had 16 completed strips sitting there on a backup disk doing nothing, I decided to let you see them between now and the end of the year. 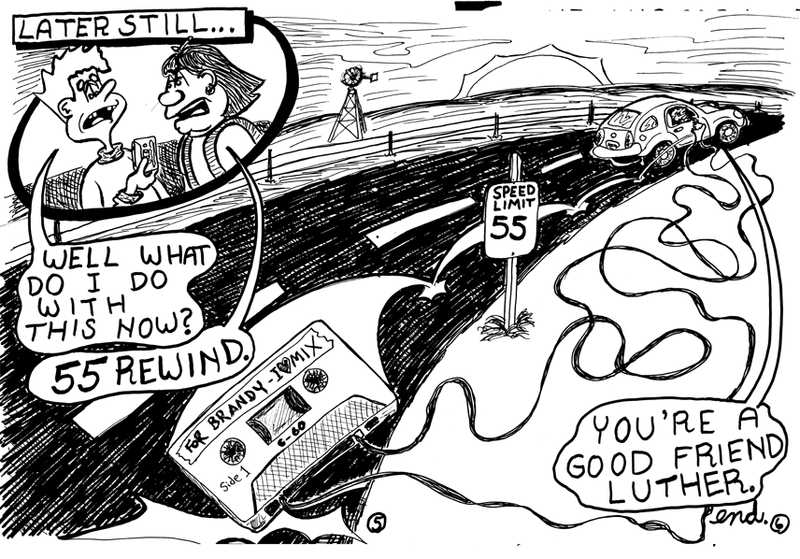 Today I'll release Walk This Way the first Blank Tape Comic I completed, though not the first released. For that check out 55 Rewind. I'll release them Monday, Tuesday, and Wednesday through the end of the year...and the end of the strips. 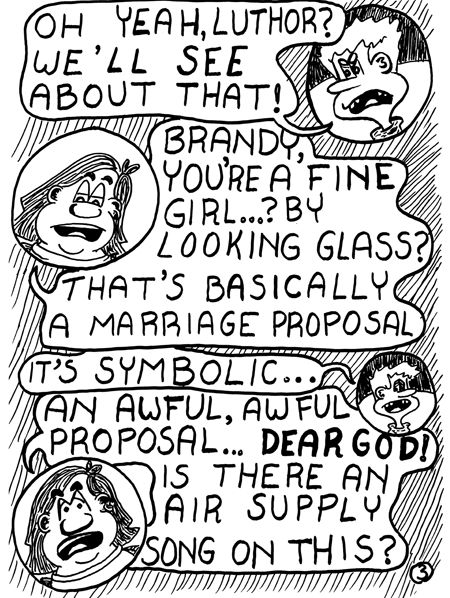 Blank Tape Comics was originally conceived as a three times a week gag comic with a loose continuity. The adventures of Wendell Winger, a teenager in a small town trying to survive the late 1980s. It is admittedly semi-autobiographical and steeped in nostalgia. It didn't end up working for a ton of reasons, but I learned a great deal while working on these strips. I hope you enjoy them. Looking back at them now, I like them well enough, even knowing that in a lot of ways they could be better. Each strip comes coupled with a music video that matches the strip's title, part of the original conception of the idea. 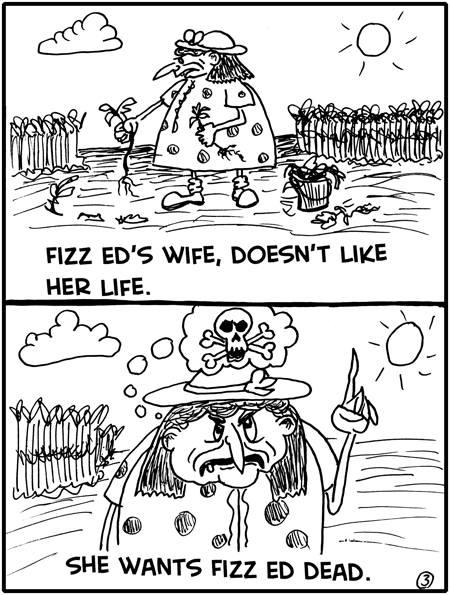 This was to add additional content to each strip, as well hopefully be a conversation starter for the comments. 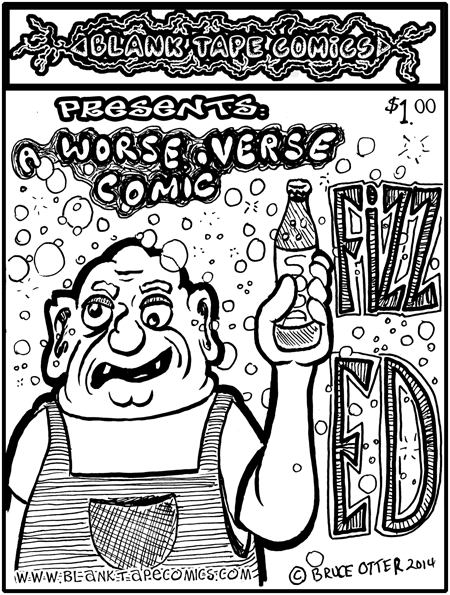 Fizz Ed: A Worse Verse Comics was the second mini-comic produced as part of my podcast challenge with Larry King, my partner on the Media Montage Podcast for our 'Making Mini-Comics' episode. Ed was a character born in my sketchbook, not too bright, but hardworking, and deserving of some good fortune. 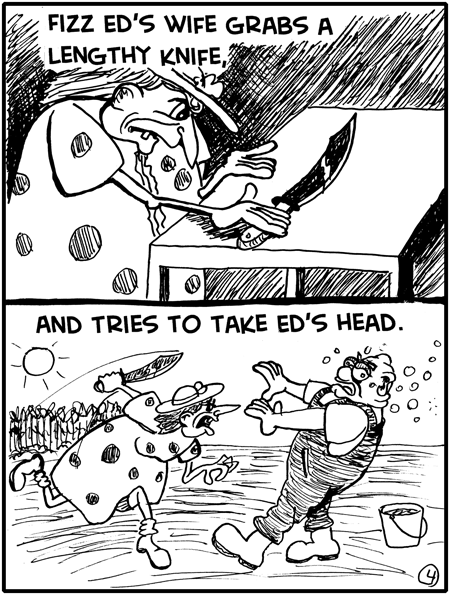 This mini-comic was was the first of two, written and drawn as part of a challenge for the Media Montage Podcast by my podcast partner and cartoonist, Larry King, who did a couple of comics himself. This was also designed for print, and has been printed and distributed as a printed comic.